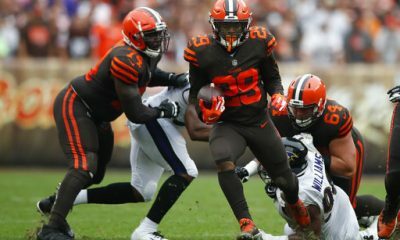 CLEVELAND — The Browns players had company when they ran out of the tunnel for the season opener Sunday against the Pittsburgh Steelers. 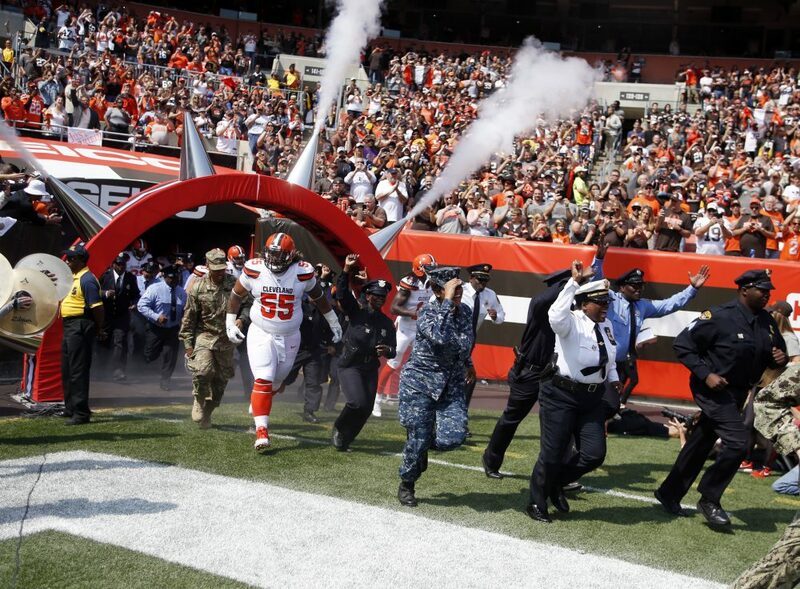 The Browns were joined by Cleveland Police officers, first responders and members of the military in a show of solidarity. After taking the field to applause, they stood on the sideline for the national anthem. Many of the officers and military saluted, some players put their hand over their heart and others linked arms. Owner Jimmy Haslam stood at midfield at attention with his hand over his heart. Wife and co-owner Dee Haslam linked arms with tight end Seth DeValve and a police officer. Players and members of the organization met with Cleveland Police Chief Calvin Williams, who participated Sunday, and other officers during the week to discuss a way to come together. Police union chief Steve Loomis had said police and other first responders would boycott participating in the scheduled flag ceremony after 12 players knelt in prayer during the anthem before a preseason game. Loomis changed his stance after the meeting. The players knelt days after the violence in Charlottesville, Va., where neo-Nazis clashed with opposition groups, and said they were praying for racial equality. Many fans expressed their displeasure to the organization, and a VFW post in Strongsville said it would stop showing Browns games. The Browns’ was the largest protest by an NFL team since former 49ers quarterback Colin Kaepernick began not standing for the anthem last season. Hall of Famer and team adviser Jim Brown talked to the players after the anthem protest and encouraged them to find more appropriate ways to effect change in the community. “It was huge,” coach Hue Jackson said of the pregame festivities Sunday. “We all are in this together, and that is what it is all about. I think whatever has gone on in the past, we let all of that go. A video was played on the giant scoreboards featuring rookie quarterback DeShone Kizer, cornerback Jamar Taylor and tight end Randall Telfer among others discussing the importance of unity. McCourty thought the involvement of the Haslams was critical. DeShone Kizer has brain power and star power. Can he be the one?